The bright colors show the area being studied for residential use in North Bayshore. Yellow is Google-owned land. All year, the Mountain View City Council has been preparing to add housing into the city’s North Bayshore business district. But the big question has been this: How many homes? On Tuesday, a number finally started to come into focus — up to 9,100 units. The council indicated its preference for a range of 6,700 to 9,100 units, which was the densest option in a slate of four development scenarios presented by city staff. The straw vote came during a study session as officials hashed out what kind of residential community they wanted to see develop in the North Bayshore, home to Google, LinkedIn, Intuit and Microsoft. The decision doesn’t instantly allow that much housing in the North Bayshore, a 500-acre enclave cut off from the rest of the city by Highway 101. But it’s a critical step because it informs the environmental review that paves the way for updates to the area’s existing land-use guidelines and zoning. In essence, it sets the upper limit for what could be allowed in the district, though adoption of a revised plan remains many months away. The meeting is a milestone in a story arc that has been among the most complicated Silicon Valley land-use sagas in recent memory. Voters agreed, and a pro-housing council majority was voted into office last November. In February, they began to study what it would take to add housing back into the plan. The answer: An update of the 2014 precise plan's environmental review, a complicated process that will take months. It also may be critical for the expansion plans of Google, which is looking for ways to reduce traffic so that it can build ambitious office projects. Yet allowing housing brings with it a host of tricky questions, not only over how many units, but also where it should go, what it should look like, and what kind of services it would require — even how many bedrooms the units should have. On Tuesday, council members supported a land-use plan that would allow — but not require — residential uses over 60 acres of land. Most of that land is owned by Google, which supports building housing in its backyard. But other land owners — including Peery-Arrillaga and Renault & Handley — are also in the mix, and it’s unclear how the council’s vision fits in with property owners’ individual business plans. Already, the city is processing a conceptual proposal from the Sobrato Organization that would add 370 units of housing and 400,000 square feet of office off Space Park Way. “The key is to incentivize land owners to convert from office to residential,” said Cliff Chambers of the Mountain View Coalition for Responsible Planning, which supported the highest residential density possible. 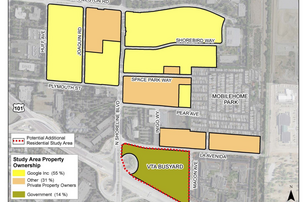 The council also supported studying housing on the Valley Transportation Authority’s bus yard. Google is in talks with the VTA to either acquire or lease the 17-acre site, though the VTA would need to service its bus fleet somehow. 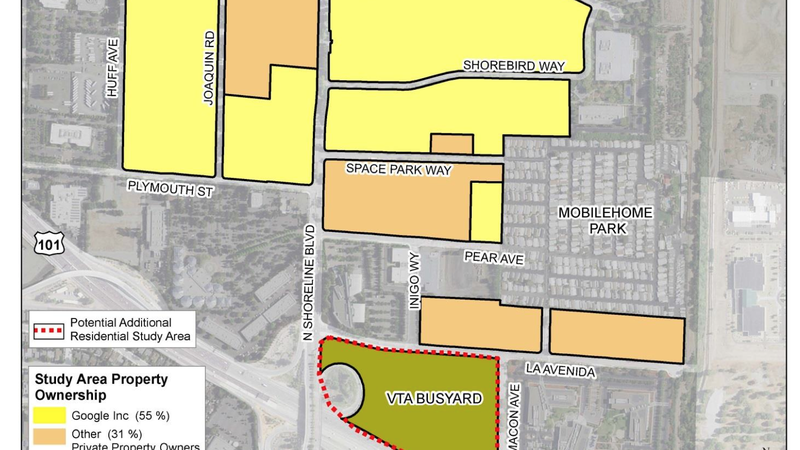 In a letter to the city, Google reiterated its position in favor of housing there: “As part of a mixed-use site, we believe that the VTA Site is necessary to create the quantity of housing needed in North Bayshore,” wrote real estate executive Mark Golan. The unit count being contemplated is ambitious, and far exceeds previous numbers floated, most notably a number around 1,100 that had been studied in the original environmental impact report but later dropped from the plan by the former council. City staff considered that figure early on, but later set a minimum of 2,800 units in the scenarios presented to the council this week. "Eleven hundred units just wasn’t enough to create a substantial new neighborhood and also support, say, a local grocery store," said Martin Alkire, principal planner for the city, at the meeting. "As you get to 3,000 units, we felt that was a reasonable starting point at the low end." If fully built out, the 9,100 units would be larger than all of the units constructed in North San Jose since the passage of the city’s transformational north San Jose plan, which allowed 8,000 units in an initial allocation that is now nearly drawn down. For instance, the massive north San Jose Irvine Company projects known as North Park and Crescent Village total about 4,950 units. A staff report says that the 9,100 unit figure could produce up to 13,600 residents. Yet it's notable that even though the unit range is large, it still lags the number of workers who will be added to the district in the years ahead — to say nothing of the existing employee base. What gets built in Mountain View is likely to be much different in appearance than what's typical in suburban Silicon Valley cities. To make the most of the very compact opportunity sites, council members supported buildings that could rise 12 stories tall, a height that is rare for residential projects in Silicon Valley outside of downtown San Jose (and is even pretty rare there). “If we want to mitigate some of the jobs housing imbalance, it’s going to require a greater number of 12-story buildings compared to five-story,” Chambers said at the meeting. One issue the council wrestled with involved number of bedrooms. The environmental study supposes very few three-bedroom units, with most of them studios, one- and two-bedrooms. But Mayor John McAlister said he believes that projects should include three-bedroom units to support families. "Why are we discouraging families in this scenario?" he asked. But the council majority opted to go along with the smaller unit sizes, which would produce more housing. What does Google think of all this? While Google is an advocate for housing in the North Bayshore, the evolving zoning puts the search giant in an interesting spot. On the one hand, Google owns the majority of the land where housing could be built, giving Google control over what and when to build. On the other hand, that land is fully developed with offices, and Google already says it doesn't have enough office capacity in North Bayshore. While much remains unclear regarding Google's plans for housing, the search giant did confirm on Tuesday that it would build affordable housing into any residential project it undertakes, rather than paying in-lieu affordable housing fees. Mountain View allows builders either to either designate 10 percent of their project as affordable or pay the fees. Integrating affordable housing into market-rate residential projects is considered a quicker and more efficient way to gain affordable units, though it is not required. Google also said in a letter to city officials that it would not restrict its possible apartment projects to Google employees. "Rather, projects would be designed to encourage any North Bayshore worker to reside in order to accomplish traffic mitigation and help achieve a better jobs/housing balance in North Bayshore," Golan wrote to the city.